Dear Members, the Club’s Annual General Meeting (AGM) is rapidly approaching – this year it will be on Monday 3rd June at Lytton Hall. The Committee will propose deletion of Article 7.3 of the Club Constitution, which reads: “No Committee member can stay in their position for more than three years in succession“. The committee will propose deletion of Article 7.10 of the Club Constitution, which reads: “The Committee has the power to co-opt on two extra members [to the Committee] if required“. The Committee wishes to replace these two positions, with two permanent positions that will be electable like the other Committee Officer positions. These two permanent positions will be: (i) Diversity Officer; (ii) Member without Portfolio. When the constitution was originally drawn up, Hammersmith Chess Club only had 30 members, and the club had recently emerged from a period of mis-management. We are now approaching 100 members – a truly amazing achievement in less than 5 years. There are critical decisions to be made over the next 12 months – larger venue, new initiatives, more teams etc. – and to lose the experience of the current, well-functioning committee that has steered the club to our current position, would be precipitous. The Committee functions in a truly democratic fashion, is effective in providing oversight, and there is now little danger of one person dominating the Club. The Committee therefore believes that the Club is best served by allowing experienced Committee members to continue in post, with appropriate oversight from the Committee and the Club membership, and we wish to drop the three year limit on individuals holding Committee positions. The Committee recognises that the Diversity Officer needs to be a permanent voice on the body, to broaden our membership and be more representative of the community in which we exist and draw our members. There is much work to do here, and we must therefore make this important role a permanent position. The Committee Member without Portfolio will assist with the workloads of Club Captain, and Secretary, recognising that the huge increase in members requires further support for both of these positions. The role holder will also take on support for other Committee roles at the discretion of the Committee as the club evolves. They will report to the Committee through one of those Officers. These new roles will be defined under an updated draft of the Constitution. Any member can stand for any position on the Committee, but must have their nomination seconded by another member and give notice to the Secretary 30 days before the AGM. 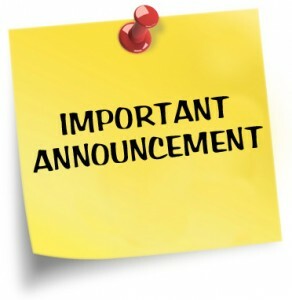 REMINDER: The AGM is on 3rd June 2019 at Lytton Hall – see you there!! Welcome dear readers – it’s been a while! 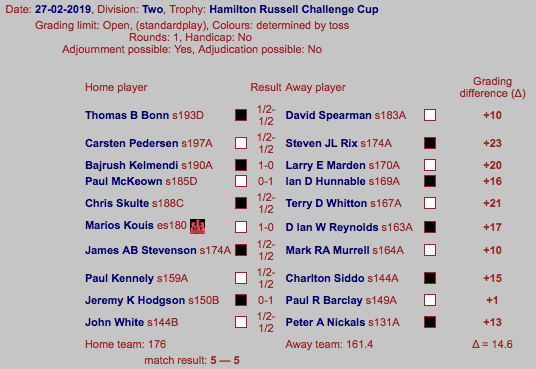 Please read on for a slew of match updates, and the conclusion of this Season’s Hammersmith League! This is a painful report that has been delayed by your correspondent as it was truly a case of March madness. This report from Middlesex 2 and 1 sectors, makes grim reading and is a tough one to put down on paper let alone a website. 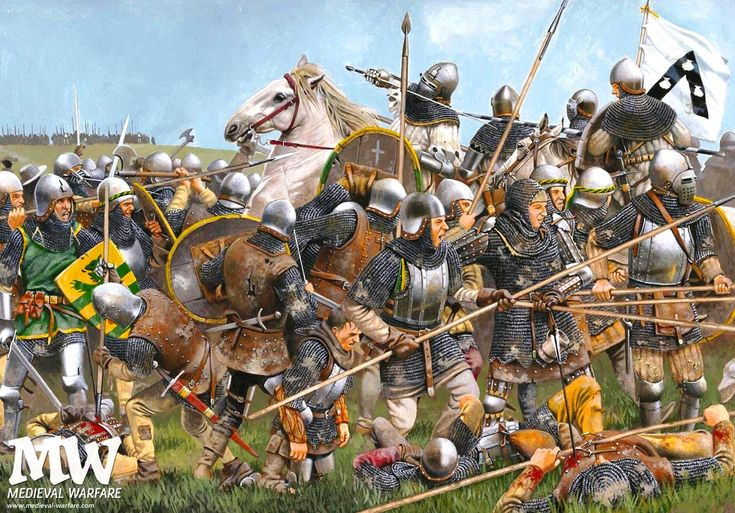 Hammer 2 took on Muswell Hill 2 and Hendon 3 in bruising encounters whilst the ray of light was shone by Middlesex 1 – in a bloodthirsty encounter with a real powerhouse Hendon 1 – in possibly the most heroic performance since Horatius defended the Pons Sublicus in the 6th Century AD. Total Clueless hyperbole you may say, but wait and read the full report. Furthermore, the use of Foundation in the title of this report is a nod to the Foundation Trilogy written by Isaac Asimov and arguably the most influential Sci-Fi series ever written. The story of the Foundation being the shining light preserving knowledge and science as a decaying imperial empire unwinds, contrasts very well with the Hammer and Hendon chess clubs. I leave you to decide which is which. Middlesex 2 needed a win against Muswell Hill to keep up in the battle against relegation. As you can see from the scorecard we just fell short. It was a tough night for the Hammers and the result was in doubt right down to the last seconds of the final game to finish. First to the Hammer heroes – Javier S and Paul M – both played great games with Javier allowing zero counter-play whilst gradually squeezing his opponent – it was a commanding performance. Paul M played a model endgame and was able to convert his plus pawn advantage into a good technical win. There were draws for Eddy, Neil and Captain Clueless. The first two played very solidly and were never in danger, whilst Clueless overlooked a queen manoeuvre in the Scotch which might have yielded a win – such is chess. Tough losses for both Charlie and Javier G with the latter though a pawn down, had the initiative and all the pressure. Due to my own game I did not see what happened but it was sudden and hence I can only put it down to an error on Javier’s part, it was just one of those games. Charlie decided to be aggressive form the start and was launching his K-side pawns up the board against the castled white King. A tactic much utilised by our beloved Chairman. 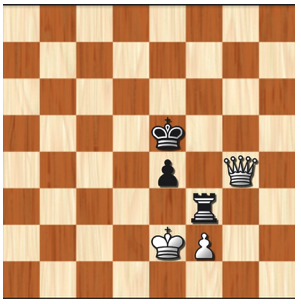 Unfortunately, his King was not safe and his opponent took full advantage – Charlie was left with a passive position and little could be done to save the day. The most impressive performance of the night was that of Paul K – aka “Dead Eye” – he played a game that reminded me of Fischer in the second game of the 1992 rematch with Spassky. Through sheer gutsy defence and tenacity, he emerged a pawn up in an endgame which saw white with rook, bishop and knight versus Paul’s two knights. Dead-Eye gradually improved his position and started the march of his passed pawns – alas the position was so complicated he consumed too much time on his clock. I think there was a study-like win there, but would have required a Magnus Carlsen to find it. In the end searching for the firebird, our man went down in flames – he was so unlucky. The second encounter that week saw the Hammer 2 team travel to a nemesis of ours – Hendon 3. Clueless could not attend and Brian stepped into the breach and took control of the team. This was the grimmest of nights where the Hammer heroes were out-graded on average by approximately 40 points a board. The score-card tells the story – a really tough night for Hammer 2 – no disguising it. All I can say is I feel your pain and was frustrated not to be there. The only way to respond to this is to move on – we and especially Captain Clueless, will do better next time. The ray of sunshine was the following scorecard from Middlesex – Hammer 1 lead by the legend that is Zeus. The Hammer crew took on the winners of the Middlesex League for the last eight season – Hendon 1. Just take a look at the score-card – Hammer were out-graded by 44 points a board – Hendon fielded two of England’s top 15 players on the top two boards. Zeus had trouble getting a full team out – Sorted and Clueless answered the call to arms, yet we came within a half point of drawing the match – and in some ways we should have won it. There were huge wins for Carsten, Bajrush and Zeus – all three downing opponents whose ECF rating is something you do not see every day of the week. One of the abiding memories of the night is the sight of all seven Hammer players surrounding the board as Carsten found his way to a deserved win. This was real Hammer spirit from the lads and a stellar performance from Carsten. This is what makes a club and a team – you could feel the collective will in the room. There was only the non-playing captain from the Hendon side to urge their man on. To me, that is what Hammer is all about. Please forgive the scarcity on detail here but my game was totally absorbing and demanding. Board One saw Chris take on GM John Hawkins, British Chess Champion from 2015, despite downing an IM in the last 4NCL weekend, this was a bridge too far for Chris. He was also unwell and answered the call to arms despite that – he is a true Hammer and Tiger blood. Board 2 saw Thomas lose on time to an IM rated 247 – the fact was he had made it to a drawn position – he was so unlucky. Unreal performance. Our Great Dane on board 3 just won by accumulating pawns – he harvested well and scored a superb win. Bajrush, played a dream of end0game where his opponent was relying on error to save the day. Wily was just so technically right and scored a decisive win – just brilliant. Sylvain, was also under time pressure and it cruelly robbed him of a deserved draw – he was so unlucky. Zeus on board 6 was in his best form – he basically won at a canter. It was superb – Hammer at this stage were level on the scoreboard. Charlie was out-graded by 60 points, he defended the black side in a French and although two pawns down put up a great fight. He did Hammer proud. I thought I could win by chopping the rook off and grabbing the pawn – then I would gain the opposition and Queen my pawn – I was so wrong. Put it into Stockfish and see how the brain wins it. This Middlesex 1 result was probably the best performance by any Hammer team in our 57-year history – we put in an average team rating of 216 across all eight boards – amazing. Hammer is going in the right direction – doing it the right way – our best days are ahead of us. Our new tagline on the web site is “More than a chess club” – this is what we are. Hammer Royalty enjoying the delights of the Duke of Cornwall after the Hendon 3 encounter. So there is light in this report and possibly the start of something very special. Captain Clueless urging all Hammers to stay true and keep the faith. This match took place in a very prosperous part of Surrey, in Egham – read on about our adventures there! A country walk that is quite remarkable is that from Egham to Runnymede, where the Magna Carter was signed. Egham is a satellite hamlet a few miles from Staines, that has accumulated much wealth over the years as a prosperous commuter centre to Londinium. “It was not a fairly tale start of my retirement and of my first game for Hammersmith. The critical moment in his game follows: can white win? Nadhmi said afterwards that he used time to his advantage, he had at least 10 minutes more than her by the end of the game and at times during the game up to 25 minutes more than her early on. Well done! Everybody else draw, although Jonathan had adjourned first. 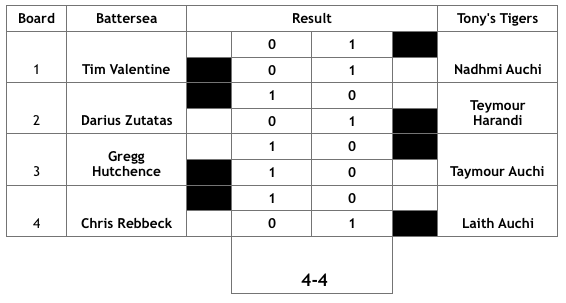 We went down to the wire this match and lost by one point: Staines 3.5 – 2.5 Hammer B. Had I planned properly and got a proper train ticket, and had I beaten the kid with under e100 rating, we might have won, so I award myself the “wooden spoon”. Although he was seen as the champion of the weak and a great protector, Hercules’ personal problems started literally at birth. 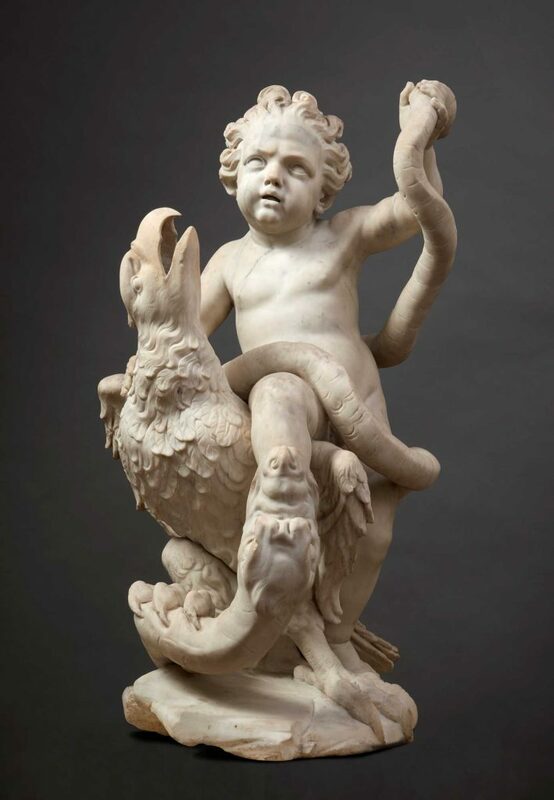 Hera sent two witches to prevent the birth, but they were tricked… Hera then sent serpents to kill him in his cradle, but Hercules strangled them both!! Welcome to Andrew Macdonald, a junior who debuts in the team this season. We had black on top board. First to finish was board 6, Andrew who eclipsed his guy in record time using a 2 piece combo attack to win a rook early on. Nice! Then came John White against a seasoned FIDE rated player, S.Schmitt on board 3. Looking about equal for a long time, having 2 doubled rooks in play, perhaps John was winning. But then the rooks got separated, and his opponent got prolonged checks on 7th and 8th ranks with a rook and bishop which John doggedly defended without being mated and without pawn loss. Our two juniors Alexander Jamieson on board 1, and Nadhmi Auchi on board 3, got into long endgames that looked like wins, but were inconclusive at the end, a Herculean effort. I thought Nadhmi was winning for a while. Bad luck! Congratulations to Paul K and Andrew M for their wins, which secured our victory. The Hammersmith League contestants once again do battle at The Anvil. 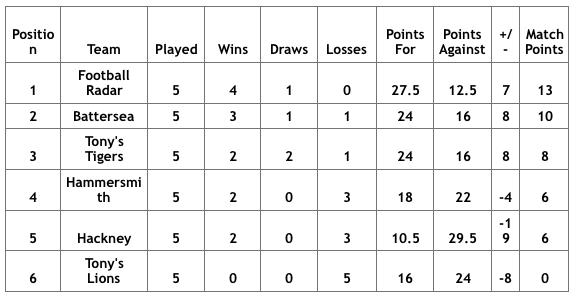 The first four rounds had seen some bloodthirsty encounters as well as some subtle positional efforts with three teams vying for the coveted title of Hammersmith Rapid League Champions. The maths was simple: if Football Radar win, they would be crowned champions. If they lost, they could be overtaken by either Battersea or Tony’s Tigers. This was the perfect finale to the tourney. A dramatic night unfolded once again… I invite you to read on. To be honest the Radar were in Fischer mode, not only did they sweep the Hackney crew aside but they did so in imperious form… just unstoppable. Great credit to Adam and his teammates, they really won the title in style. The Radar were unbeaten – scoring 90% in the tourney and winning four matches, with one draw. Our deserved champions – they have come a long way in less than two years. The second match saw the potential challengers face off… Battersea and the Tigers… this was a match of two halves with Nadhmi and Gregg both pocketing two points each in powerful displays. Battersea won the first round 3-1 but the Tigers reversed that in Round 2. A drawn match was the fair result, with both teams demonstrating great sportsmanship and tenacity. I must single out Chris Rebbeck here, whose sportsmanship was of the highest quality. A total gent. To the final match which was a real fight for honour. A close match ensued between the Hammers and the Lions.. this was the wooden spoon game. What followed was a fascinating match. In the early kickoff, Amaya over-powered Charlie in both games with a real neat mating finish in game one. The second saw her more experienced technique carry the day. Hammer 2-0 up. Connall and Ben completed their two drawn games at a rapid pace… the quality was there, it is just they did not hang around. Two draws on the top board. Dave on Board 2 lost a piece early on to Kamrans and was always on the back foot. Somehow he swindled his way back in and won. I know he felt very guilty about it. It takes great strength of character to come back from that, but Kamran showed loads of it, to comfortably draw the second game. 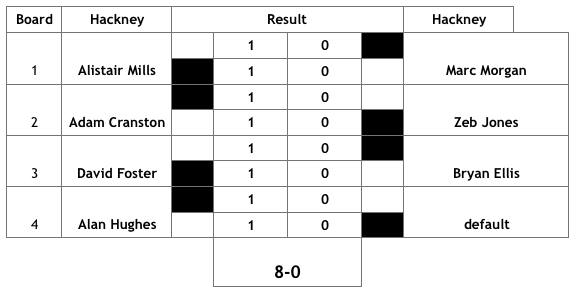 Emerging from a truly – and I’ll have to watch my language here – “disappointing” defeat against Kings Head in round 9, Hammer 2 had a great opportunity to put things right again as we faced up to a quick fire double-header against Wanstead & Woodford and then Metropolitan 4. Fortunately all is well with the world as we rebounded with a resounding 7-1 WIN vs. Wanstead & Woodford. So, first up was Wanstead & Woodford. A near perfect performance from the Hammer crew, aided in part by the no-show of David’s opponent on Board 6. Nadhmi’s game was particularly interesting to watch (and no doubt painful to play) as he tortured his opponent, Magnus Carlsen style, for 20+ moves searching for that elusive win. Looked drawish to me; he managed to crowbar open the door slightly, but it wasn’t enough. Brian’s match is presented here; by his own admission a wild example of the O’Kelly Sicilian. Another match where we were effectively handed a head start, this time 2-0! Jonathan and David (again) were forced to sit out, with walkovers announced shortly before kickoff. The grading differences also helped (!) but everyone went about their business in the right way and brought home the victory in short order. It’s worth a word on our 3 debutants on the night – Andrew, Javier and Christof – each scoring the full point apiece. Andrew roundly bested his junior peer in record time, taking advantage of some rash tactics to take a material lead. He’s developing into a player who demands respect over the board. Christof professionally and methodically ground down his man despite facing a most stubborn of defences from his English counterpart. The Brexit analogies are obvious, but at least Mr.Hamilton had the good grace to shake hands and admit defeat when all hope was lost. It’s a pleasure captaining you lot! Onto the next one. Yes, the next blockbuster event, brought to you by 21st Century Hammer Chess Productions is an evening with GM Danny King – chess player, media start, author and all-round top bloke. The evening will be part lecture, and part question time. Those of you who attended the Jon Speelman evening in February last year will know what an evening like this can do for your chess knowledge. Please note: WhatsApp or text messages will not count! If there are spare places after the 18th April it will be opened up to Non-Hammer members at a cost of £7. Hammers – it’s over to you!! Yes, the Hammer chess club’s major community event is coming up, celebrating it’s THIRD anniversary! This is an amazing day where the Hammers boss Lyric Square for the day, introducing the general public to our brilliant game, and raising money for Hammersmith MIND, not to mention further enhancing the camaraderie of the club! In the last two years we have raised over £1,200 for MIND and recruited a number of new members – this all happens because of the volunteer mentality endemic in all Hammer members. Hammersmith MIND will also be there, and coincidentally it is the weekend before Mental Health Awareness Week! This cannot happen without you volunteering – even for a couple of hours. So, Hammers, it is time to clear the diary and get involved. Email the PR Office – john.white49@ntlworld.com – stating that you want to get involved, and what times you’re available for. Two members have already volunteered, and the committee will step up as usual, but we need the mass participation that we get every year to make this a day to remember – now it’s your turn! Hammersmith MIND and Hammersmith Chess Club – together it makes sense. Come what may… groan!, this was a draw 3-3, lessons to be learnt… please read on. I thought we could get a positive indicated result, but our two juniors were to be cruelly done in. This was a grudge match with Wimbledon, where previously we were crushed, this time we drew with a much stronger team on our Hammer side. So, a small success, which I’ll take anytime. The rating differential shows as zero on board 6, and the other boards are slightly heavier on the Hammersmith side. As we drew, Wimbledon may yet get credit with a point win, if rating differentials are used in closely matched season end results. 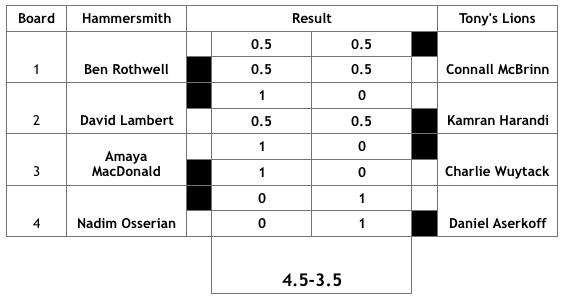 Hypothetically if the fide rated opponent’s rating using ecf equivalency were to appear on the score card rating differential, the point win might be reversed. That apparently is a big ask, but I mention this anyway. Attention Hammers – we need your input! As the club continues to grow, we will be hiring Lytton Hall on Monday AND Tuesday evenings next season. This is being done to ensure we can dedicate one evening to home matches – allowing players a quiet, calm atmosphere in which to play their games; and one evening to Club Nights – where we’ll host casual games, organise competitions, hold events and lectures etc. It’s going to be a really positive change, allowing us to provide the perfect atmosphere for those important matches, and giving us the space and freedom to run events and casual chess, all in the same week. With great change comes great responsibility though – and we need your input as to which of the two evenings should be our “Club Night” – Mondays, or Tuesdays. It’s DECISION TIME! It’s an important decision, so we are putting it out to our members for guidance & have created a poll for you to vote on – below. 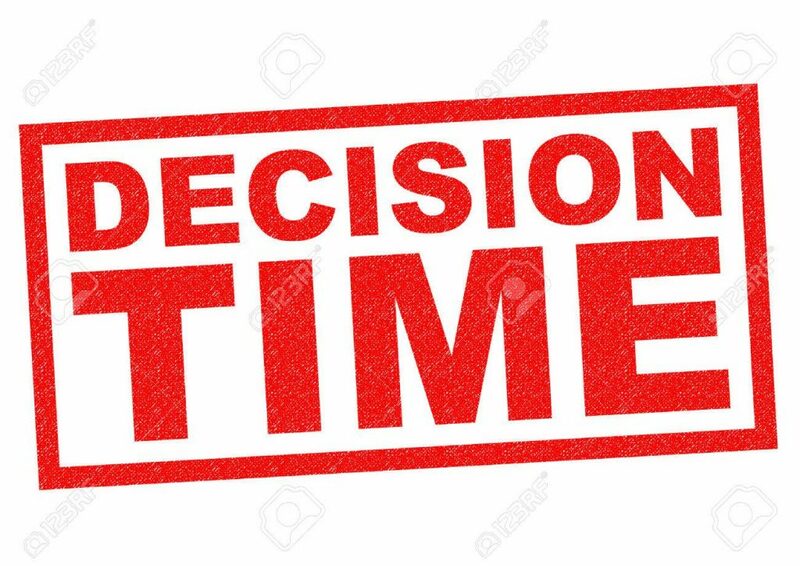 Things you may wish to consider when you cast your vote: your personal weekly schedule; other chess commitments, logistics of getting to Lytton Hall on different nights, work, family life etc. Let us know what you think – feel free to post a comment below too – we’re keen to hear the views of all our members. Thanks for your time! Would you prefer Club Nights to be held on Monday or Tuesday next season? Yes, stretching the fabric of acceptable punnage, we present here a recent match report from debut-correspondent, Kostis. Enjoy! With four games to go in the Middlesex League and being at the top of the scoreboard, two points ahead of Willesden & Brent, the Hammers arrived at the Actonians Sports Club to play against Ealing, with no intention to negotiate. On Boards 7 (Nick) and 8 (Javi), the games were almost over with both black sides up the exchange. Nick converted his advantage quickly, pushing his opponent’s pieces towards the King to deliver a deadly fork with his bishop, before shaking hands and securing the match for Hammersmith. Meanwhile on top board, Brian had an open position as black, having placed his knights in the middle of the board. After a couple of exchanges and a few tactical moves, a draw was agreed 5-2. One game to go on board 2, with Jonathan having less than 3 minutes on his clock to his opponents 30+. Carried away with the idea of running Jonathan’s clock down, his opponent missed a check-fork that would have wiped the White square Bishop off the board and instead grabbed the a2 pawn. 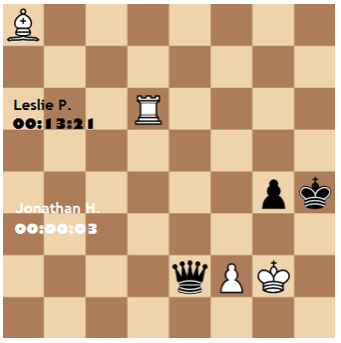 38 seconds on the clock and the material is “equal”, with Jonathan having a rook pair, a light squared Bishop and 3 pawns, to his opponents Queen, dark square Bishop and 4 pawns. The game reached the position below with black to play and 3 seconds for Jonathan, who refused to drop his weapon. Two blunders (…g3, Rd4+ Kg5, Kxg3 Qe5+) and Jonathan delivered the finishing blow to fork King and Queen with f4+ and one second on the clock. If only he had 20 seconds on the clock he could have even won the match (mate in 10). 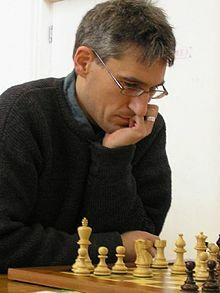 But saying that… his opponent would not have played so recklessly, as he was obviously focused on running him out of time, when he would have been better off using his advantage on the clock to outplay him – by probably chasing the rook and/or bishop over the board rather than the King. A 5.5-2.5 win for Hammersmith then, and a very good chance of being promoted! First up, a couple of reminders for you – Monday 18th (tomorrow!) marks the first of our FREE beginner lessons at the club, starting at 6pm. ECF registered trainer and Hammer legend, Tony Niccoli, will be hosting the session. 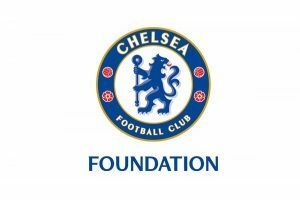 It is 100% totally FREE, generously supported by the Chelsea FC Foundation, and is aimed at beginners and those returning to the game. Anybody and everybody is welcome, so if you fancy a bit of top-level instruction on the wonderful game, just come on down. We are ridiculously excited about this initiative, and would love the local community to get involved – please spread the word! Following that session, we then have TWO home matches in the Thames Valley league starting at 7.30pm, so we are asking anybody who would like to continue playing casual chess to kindly decamp to our ‘overflow facilities’ at the The Albion public house, on Hammersmith Road. We’ll have some boards setup there to cater for you. If you do want to stick around at Lytton we will need to enforce a strict total silence policy throughout the duration of the matches, please. Come next season, we’ll be running all home matches on Tuesday nights so our Monday’s will be free for casual chess & events, however we need to accommodate some home games on Monday for the remainder of this season, so we appreciate your help in making Lytton a great environment to play tomorrow night. That, and the troubling news in parliament, nothing was very propitious… But chess players are made of sterner stuff and must endure, right? First to finish was our esteemed John White on board 3, whose opponent got up quickly, shook hands with John and left the room. John White smiled ruefully and mouthed a (grand master) draw. A couple of minutes later, seeing the match was already won, Paul Kennelly and Ivan Gorgiev stopped play, with adjudication requested. Overnight, Ivan was to email his resignation. Paul’s three connected pawns and two rooks looked to be winning against 2 pawns and 2 rooks. A match in two halves, top boards halved 1.5-1.5, as is customary; lower boards carried the day with 3 wins! Now our 3rd win in a row, we are looking good and have probably staved off relegation. Christof B., new Hammer member, gives an account of his first over the board chess tournament for nearly half a century. This is a fascinating article with a great outcome. In his own words, read Christof’s modern chess odyssey. With the Brexit date decided a year ago (I mean my personal Brexit, my last working day in corporate life being 29th March 2019), I had contemplated to resume a very early passion; CHESS. How do you do that, not having played for a club or in a tournament for 44 years? The Jersey International 1975 was my last one where I was lucky enough to finish joint 3rd, way ahead of a 9 year old Nigel Short. Well, I tried playing against a computer (quite demotivating), read a few books, one of which “The Rookie” gave me some ideas, and I intend to play lots of competitive games. Playing in a club is a must, and I was lucky to join the best one in early 2019, but unable to commit to weekday games until April. I needed to find out about my level of chess fitness, or whatever is left from a long, long time ago. Thus, the East Devon Congress was a fitting trial, by coincidence its 44th event, so it must have begun life just when I had retired. This one was a tight 2-day format with more than 120 players in 3 sections. Saturday is tough with three 3.5 hour games, plus 2 more on Sunday, but it is very worthwhile to attend. The venue is the Corn Exchange in the centre of Exeter, and the event is flawlessly organised. Since I did not have the slightest clue about my current strength (grading was introduced after I had retired from chess), I registered myself in the Major section. To my annoyance, the organisers had added the informal 100e grade from the Hammersmith website to my name in the list of players, all of which were between 125 and 154, making me look a somewhat odd wannabe! I immediately realised a visible change from four decades ago: then most players were old, now most are young – at least seen from my perspective. My opponents ranged from 13 to 71, both among the highest graded. Well, the first game finally came, and I felt the same excitement building up as 44 years ago, sitting among the 120+ players, hearing the noise of 60+ clocks ticking, and my heart jumped to 180 (I hope my ECF grade will follow suit) when I realised the chance of winning a competitive game for the first time in 44 years. What a feeling! Not so much like a Rookie, but like a Phoenix rising from the Ashes. And it was not so much the winning sensation as it was when I was young, it was the enjoyment of playing each move, like in the creation of an art object by two people. 1.d4 Nf6 2.Nc3 d5 3.Bf4 c6 4.e3 Bf5 5.f3 Is this variation still part of the London System, with a knight on c3 and not f3, and with a pawn on f3 and not c3? Anyway, the typical feature of “my” London variation is for White advancing pawns on the king side and in the center and for Black the same on the queen side. e6 6.g4 Bg6 7.h4 h6 8.h5 Bh7 9.Bd3 Bd6 10.Nge2 Qc7 11.Bxh7 Nxh7 12.Qd3 Nd7 13.Bxd6 Qxd6 14.e4 Qe7 15.e5 b5 16.a4? and even allows White long castling! The follow-up in the game with the white knight moving to a2 and b4 and the closing of the pawn structure there with 22.c3 helps Black. The only benefit is of psychological nature in drawing Black’s attention (too much) to the queen side, but that is not a good advise for a strategic decision. b4 17.Na2? Ng5 18.Ng3 c5 19.f4 c4 20.Qe2 Nh7 21.a5 Nb8 22.c3? b3 23.Nb4 0-0 24.0-0?! The white king might be better protected in the center on e1 or d2. Without short castling, White can much quicker double its heavy forces on the g-file and at a certain time push the pawns. Rc8 25.f5 Qg5 26.Rf2 Qh4? 27.Kg2 Nc6 28.Na6! Qe7 29.Nc5 Ng5 30.a6? Nd8 31.Qe3 Rab8 32.Raf1 The f-pawn should be pushed immediately, with clear White advantage. 32…Rb5? This is losing valuable time. The music plays on the other side.33.f6 Qe8 34.Qf4? First, this is against the principle of pushing with the Queen behind the Rook(s) and not in front. Very concretely however, immediate 34.fg allows beautiful continuations with decisive White advantage. I would invite to self-think along the lines after 34.fg Kg7: stated below. Admittedly, I used the engine after the game to prove the correctness of fg. Obviously I did not see the forcing lines on the board, just before time control and 1 or 2 minutes left (until move 36). Qf6 threatens Qh6: and Qh8 mate. Qf6 however only works in combination with the next move and the further sequence which was needed to be seen, otherwise the re-taking on f6 with the rook as best in previous moves would have come more naturally to me. This is a great position for calculation training and for finding mating patterns. Which one is followed through depends on Black’s moves. The sequence played in the game is just one of many possibilities, one more beautiful than the other. I do not want to spoil this experience by showing what the engine proposes.Qxf6 38.exf6!! The black position looks bombproof, the pawn structure intact and the knights protecting the elements of the pawn chain. Yes, the Black King is imprisoned on the last row, but the access for White rooks is blocked where you see, the barrier e6 over-protected by a pawn, 2 knights and the rook on a6. And still, danger lurks from the White knight on g3 with its potential to jump all the fences, and e6 will be the weak spot to fall. Another win in round 4 and I was already a full point ahead of the rest, was assured of 1st prize and had to explain that I really had nothing to do with the estimate 100, that I would have been quite happy with just an UG. In round 5, after only 10 moves, I saw a nice scenario to force a draw but my opponent decided differently and so I had to fight it out, taking more risks and winning this as well, making it sole 1st place for a Hammersmither. What can I say, sorry for the e100 (but then, as an ungraded player i could only cash in the value of the 3rd prize!). I apologise that I cannot write about the Open (serial winner IM Jack Rudd came first, FM William Claridge-Hansen second) and the Minor sections of the East Devon Congress, but I was completely absorbed in the great congress atmosphere, and my own rebirth experience after 44 years retirement. The Major section was for grades 125-154 – I scored 5/5 for clear first place. In recent weeks the growing momentum generated by our run of London League victories has been accompanied by classic quotes from Greek heroes Leonidas and Achilles. We’ve used the immortal Che line “Hasta La Victoria Siempre” as a call to arms. I have invoked the sporting genius of Bill Shankly and Eric Cantona. But comrades, I cannot lie to you. Even after a week of reflection, this horrible performance and result against Wanstead remains raw. I think we must take David Brent as today’s inspiration! As usual, the 48 hours before the match featured a number of call offs. The recurring theme of the season. As ever, I am indebted to those who stepped in at the last minute, or came late directly from work. None more so than Captain Clueless, arriving at the board directly from an exhausting trip to Dublin. The Hammer team spirit remains indomitable. So to the match. We had a comfortable grading advantage of 10 to 20 points per board. Alas, we all decided to choose this evening to play our worst games of the season. For example, I defended a dull game okay, then blundered a pawn in one move. Paul was just unrecognisable. Others agreed early draws, or struggled to equalise. Only Bajrush with his customary tactical trickery, and Marios who played an excellent game in the classic style of the legendary Soviet World Champion Mikhail Botvinnik, managed to win. Still, it came down to the last two games. 4.5-3.5 ahead with two easily won games, the baying Hammer pack surrounded the boards hoping to soon get to the pub to celebrate a lucky win, rather than the abject performance. Finally, John, despite his heroic efforts and his captain’s tetchy insistence, could not squeeze a win from the rapidly diminishing material. So it ended 5-5, a result which reduces our previously sporting change of promotion to a rather remote theoretical possibility. We may beat Cavendish, but I doubt any other teams will offer much resistance to Imperial College or Metropolitan. After the miracle of Valentines Day, Captain Clueless was hoping that some semblance of balance had been restored in this very competitive and tough division. 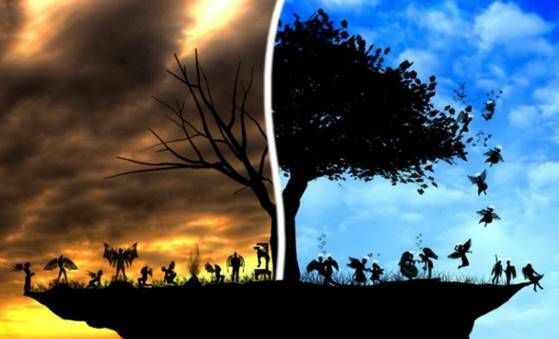 Sadly, the last days of February brought a huge reversal of fortune and resumed the pattern of 2019 results. There are no excuses to be offered… except that within a period of 10 days (in reality 8 days if you take into account the weekend) Hammer had to field 11 teams plus the journey to Hendon is a tough old schlepp after a day of work. Adding to the negative side, Captain Clueless had to take personal leave at the critical moment. This all added up to a lethal cocktail of pure trouble and adversity. 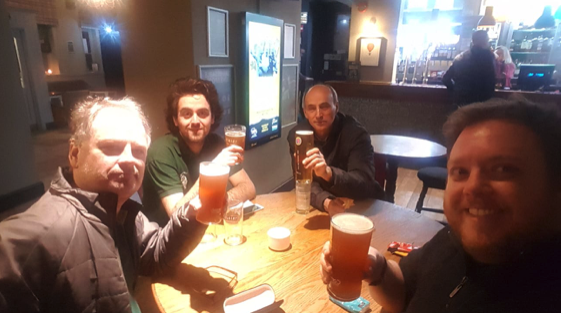 For once, Captain Clueless can only say a big thank you to the warriors who turned out for the Ealing 1 match on the Monday, and the five heroes who made it to Golders Green on the Thursday to face the toughest of tasks. The results were to go as expected when you take all things into consideration. A 6-2 loss away to Ealing and a 7.5-0.5 away loss to Hendon 4. The most welcome debuts of Amaya and Edward in Middlesex 2. I hope they are not too down hearted by their respective results. Jonathan scoring the only win against a tough team – great result against a 160. Rauno in his debut easily holding a very strong player to a draw. There is no way to sugar coat the bitter pill – Hammer 2 Middlesex are in a dogfight. We need to score plus 50% in our five remaining matches to secure the prime objective to retain Division 2 status – this is a critical time, and I need all Hammers to answer the call and step up. If Captain Clueless, let alone any other Hammer Captain, asks you to rally to the cause, then please do so without hesitation. This is vital and I urge you all to answer the Call to Arms! Hammers – answer the Call of Mother Hammer! The Grudge Match v Hounslow B – underdogs win 5-1 Hallelujah! This match in TV division 3, Hammer B and Hounslow B, was our first home match, and perhaps the fighting spirit and the urge to excel from the other two matches being held at Lytton Hall spread through the packed room and helped dispel any pre-match nervousness. Welcome to nearly everyone who debuted this team this season: Chris Moore, Ed Goldman, Olivier Vigneron and Jakub Wirecki. Veterans Nadhmi and Matteo (boards 1 and 2) rounded out the very new team. For the first hour I was encourage to see even positions with quiet manoeuvring for advantage, pretty well on every board; some tactical possibilities would emerge. First to finish was Eddie on board 4 with the black pieces our newest and most congenial club member, followed quickly by Matteo, who came in fashionably late and left early with a nice win. Way to go, Matteo! Would that we could all emulate that! Nadhmi was pretty even, but towards the end he duped his opponent with a Greek gift and then won a piece and the game soon after. Our Kuba on board 6 was fighting on against a sleeper, an unrated player playing like a 120 rater, who slowly ground him down. Unlucky. Score 3-1. “I opened with the Queen’s Gambit, which my opponent declined. I put my white-square bishop on d3 while he put his on b7. Seeing a threat I wanted to avoid I moved my knight from f3 to e5 quite early, and following that with a pawn on f4 I ended up being over-extended for the mid-game. The black queen soon went to d5, threatening checkmate and I decided to move my knight back from e5 to f3 to defend. Momentum was with black. However, a few moves later black missed an opportunity to go a piece up, as he captured a bishop on a1 before removing the defending rook with check. Time pressure was starting to affect black, and he also seemed agitated which I took to mean he thought he’d missed an opportunity but only later guessed it would be the exchange error I just mentioned. Soon queen and a rook each were the only pieces on the board, with black having a passed-pawn. However I’d managed to get my queen on the back rank to harass the black king. Black tried some traps to get a back rank mate but after dodging them and then giving my king some space by playing h3, I was able to get both pieces attacking the passed pawn while black had taken his eye off that ball. Olivier had reduced to two solid pawn islands and lovely posted knight on d5 against a scattering of weakish pawns and a landlocked bishop. Congratulations for gaining the win with technical mastery over weak pawns. 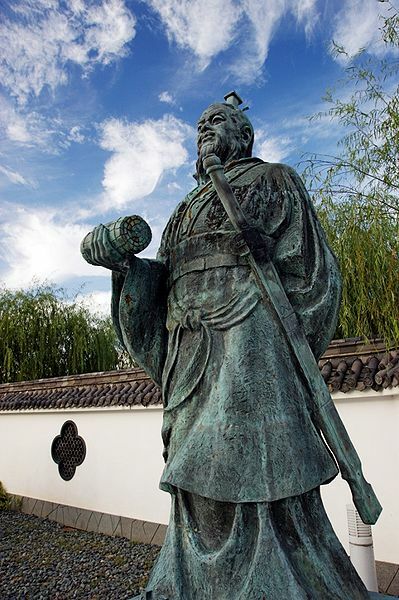 “I am a pawn up from the opening (gifted by my opponent). I played a dubious move with Ng4?! on move 12, which he was unable to capitalise on as he only played passive defensive moves for most of the middle game. Conclusion: this win brings us to 2 wins in 5 matches, so we still have a way to go to stay in the division. Would that we can keep this up. We were lucky to have Chris this time, who is going from strength to strength. 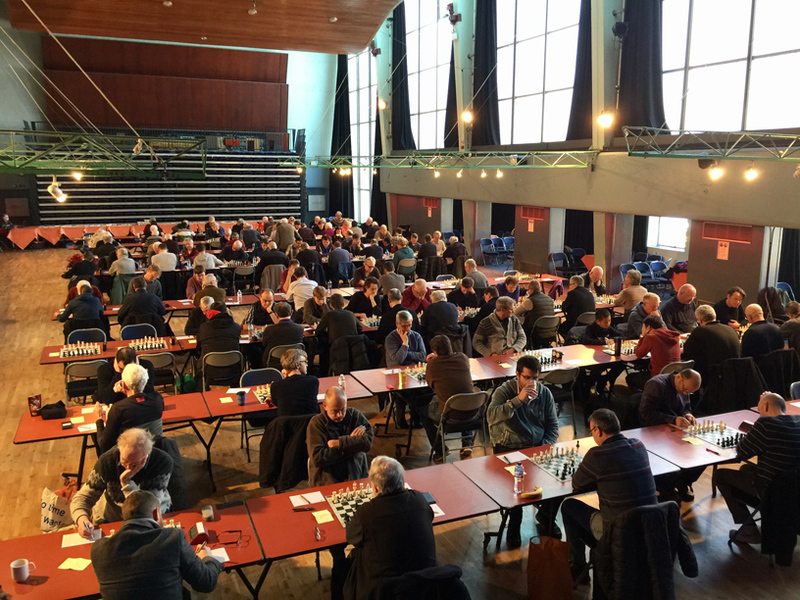 One of the major drivers in the success and transformation of Hammersmith Chess Club has been its willingness to engage with the Hammersmith community and use chess to promote something positive in Hammersmith – it is enshrined in our constitution. We’re delighted to announce that Chelsea FC have agreed to sponsor five 1-hour chess lessons at Hammersmith Chess Club, on five consecutive Mondays, starting on the 18th March 2019. Lytton Hall -aka The Anvil – has been booked, and the courses will start at 6pm. These will be aimed at introducing and re-introducing members of the local community to our brilliant game. Hammer member, and ECF-registered trainer, Tony Niccoli, will be running the lessons. He’s a dab hand at teaching the game, with plenty of experience ranging from juniors to adult regulars, and these are sure to be popular! Watch this space – the social media campaign starts now. It will be totally open with no pre-booking, and is something Andrew Ducille – senior inclusion officer at the Chelsea FC Foundation – wanted to happen. Hammersmith are grateful to him and Chelsea FC for their support. Whether this will change any football loyalties remains to be seen, but if it helps Hammer members look for the Chelsea result with a more positive view, we’ll be delighted. 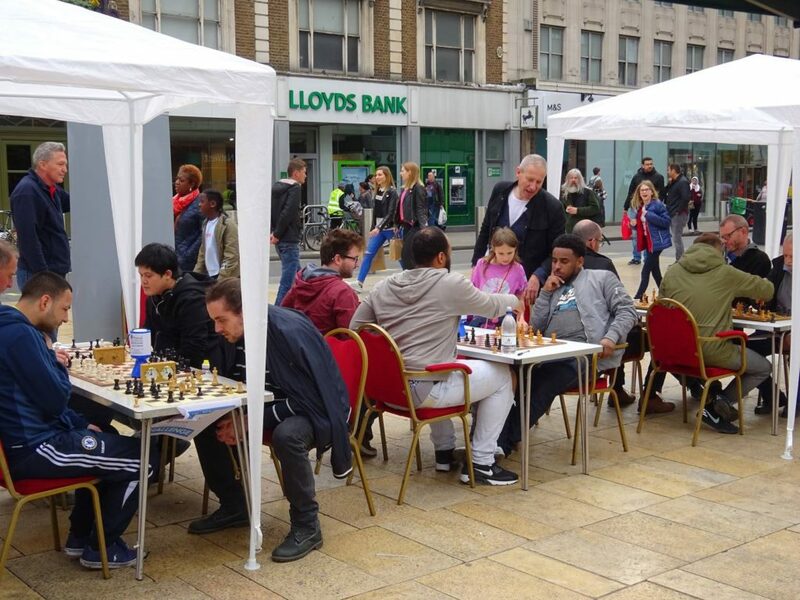 For the third year in a row, Hammersmith Chess Club will be bossing Lyric Square in the heart of Hammersmith from 10am-4pm on Saturday 11th May. This is a chess jamboree as we get members of the public to play chess and at the same time raise funds and spread the word for a worthy cause that directly helps the people of our community. In the past two years we have raised nearly £1,200 for Hammersmith MIND and we are going to add to that total this year. The format will be the same as previous years, but there may be some special appearances from our new football partners… watch this space! We’ll be recruiting members later this month to volunteer their time to help this enterprise. So put it in the diary! It’s a great day out and hugely social – the Albion pub and social chess beckons! !